Stylish apartment. Near Medieval City entrance. Private parking. 4 people. 200m from the Porte d'Aude = entrance to the Medieval City. PARKING, INTERIOR, PRIVATE, SECURE AND FREE. Located in a courtyard, at the back of the house, accessible by a corridor. APARTMENT, for 2 to 4 PEOPLE, includes: an integrated kitchen complete with a large table, 6 chairs; living room with sofa bed 130 cm, TV; a bedroom with a 140cm bed, 2 bedside tables and a large closet, and a second bedroom, with sloping ceilings, with a 120cm bed; a bathroom with glass shower cubicle, a vanity unit surmounted by an illuminating mirror; a washing machine . WC. Individual electric heating; Hot water with Cumulus of 200L. WIFI Available and free. To call the owner: phone N °: 06/13/13/34/50. 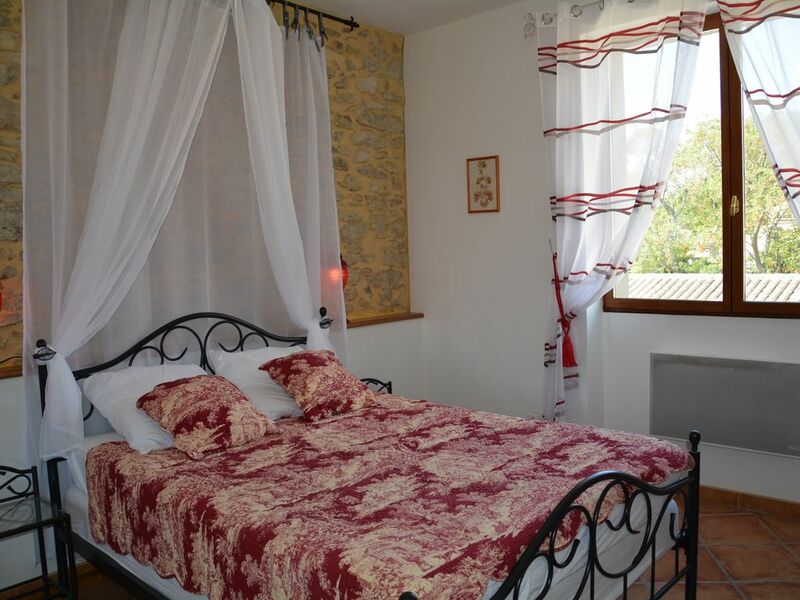 Apartment ideally located to visit: the Medieval City, entered by the door of Aude or the door Narbonnaise; to attend his fireworks and his fire, the evening of the 14th of July; at its festival, in the theater Jean Deschamps in the heart of the City and the representations of Medieval in the lists. Other sites to visit: The Bastide 10 minutes walk; Cathar castles, museums, caves, churches, abbeys, the wine cellars of Minervois and Corbières, the Canal du Midi with its boat rides ..La Haute Vallée de L'Aude. In 10 mn, by car, you will be at the edge of the lake of Cavayère, with its beaches of sand and grass, its paddle boats, water park, surfboards; its tree climbing courses, for children and adults. Near the lake, the Australian animal park open a big part of the year. THE OWNER, AT ANY HOUR: TELEPHONE: N °: 06/13/13/34/50. We look forward to welcoming you to our beautiful region. A glass shower cabin; a washbasin surmounted by a mirror lighting; with drawers and cupboards. Electric towel. A washing machine . W. C.
The location of this apartment is ideal for exploring the medieval city, it's right next to it! It's literally a 2-minute walk which was great for us as we visited often. The apartment itself was spacious, clean and had good cooking facilities. There's also a little outside area with a BBQ and seating area which is located where you park your car. We received a very warm welcome from our host. She provided us with drinks in the fridge, which were very much appreciated, and let us have some of her homegrown organic tomatoes! We couldn't have asked for a better welcome to Carcassonne. Very quiet, but close to Old Bridge, cafes and grocer, etc. Kept us cool, despite it reaching 37 degrees outside. Claudine and Jacky very helpful and friendly. Would fully recommend it. My family and I had a lovely stay at this home that we will treasure. Claudine welcomed us warmly to help us enter the parking portal (where we kept our car and walked everywhere) and show us around. The main bedroom is beautiful and our two teenagers slept comfortably, one on the futon in the kitchen and one up in the loft. The walk to the walled city was an easy 5 minutes up the hill. The walk to the new city is 15 minutes or so but there is a small store 2 minutes walk away where we bought fruit, cheese, bread, etc. (closed mid day but then re-opens). The shower is hot and dependable and the kitchen/dining room was a perfect spot to play cards in the afternoon while the sun and tourists were at max in the city. Well situated and very centra.i would have liked to have had a toaster and a kettle.would have made breakfast easier.however,i would have to say that there is no way this appartment would suit 6 adults as sleeping arrangements very unsuitable.maybe 2 adults and 4 children would manage,but even 4 of us found the upstairs room impossible.but having said that,for 4 people you coud manage for a week. Very attractive, clean and tidy, fantastic location, ideal for access to the Cite. Beautifully situated between Cite and Ville Basse. Ideal base whether on foot, by car or motorbike with secure parking. Eaaygoing, relaxed atmosphere. A deux pas de la citadelle, la location bénéficie d'une cour où on peut garer la voiture : très appréciable. L'appartement est calme car donnant sur cour. L'intérieur est très joliment décoré et récemment rénové ; fonctionnel, il manquerait peut être d'un lave vaisselle. Propriétaires disponibles et attentionnés (des boissons fraiches nous attendaient dans le réfrigérateur). Near Narbonne at 60km, Toulouse at 90km from the Spanish border at highway 1H. The beach is 60 KM. Lake Cavayère 3 KM .The Cathar Castles to 20 KM. Abbeys Fontfroide, the chasm of Cabrespine, caves of Limousis 20 KM. The Wine Cellars, Corbières and Minervois. La Bastide to 1KM and ISCED Medieval 200 Meters. Paiement par chèque (chèques vacances refusés ) possibilité de faire une réservation et un paiement en ligne ; par ABRITEL .